Sonic cement evaluation logs have been used since the late 1950s to quantify the presence of cement behind casing. The bond between casing and cement placed in the annulus is a critical component of wellbore construction. Bond integrity is inferred after the cement has cured, using acoustic methods well-known in the industry. This evaluation is dependent on the acoustic coupling between the cement and the pipe. However, if the acoustic coupling is weak, non-existent, or has been damaged by operations such as pressure testing or stimulation treatments, the cement may be present but cannot be properly evaluated, leading to ambiguous conclusions and ultimately unnecessary remedial cementing. 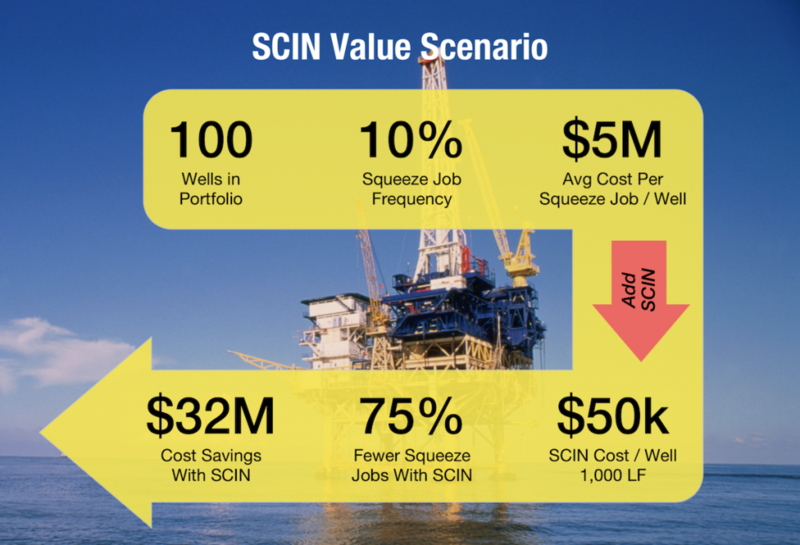 In addition to vast bond-strength improvement, SCIN-treatment significantly improves the accuracy of acoustic cement evaluation results, eliminating unnecessary cement remediation costs which can range from $100k to well over $10M per well.